As the weather starts to get nicer, and the sun starts to come out, all of Boise’s restaurant patios come out too. And who doesn’t love patio chilling? But one of the best parts about the opening of patios is that you can bring your doggo along as well. We’d say that’s a win-win for everyone. 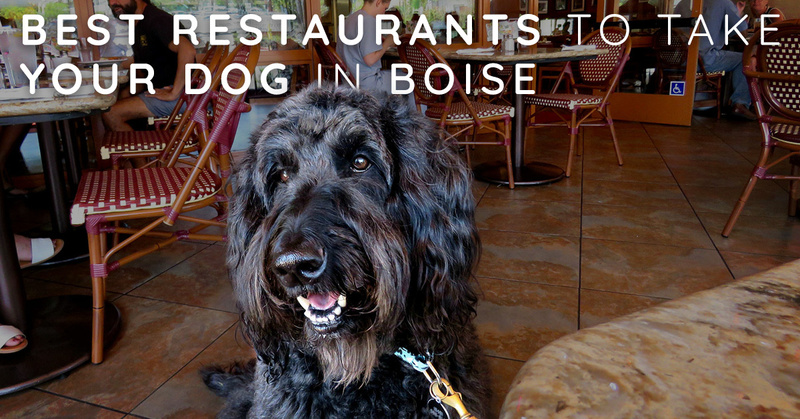 And when you and your furry pal go out to eat don’t forget to tag #totallyboise in all your date pics, and even include one of our favorite accounts @dogsgonelocal. The brand new home of one of four Good Burgers has arrived in Downtown Boise. Much more than just burgers, this new cool spot has self-pouring beer taps and a patio that welcomes dogs! And Totally Boise recommends their fries. We’re telling you, you gotta try em’. You know you can count on 10 Barrel’s delicious beer, but what you maybe didn't know is that they welcome dogs on both their bar and side patios. They’ve even been known to bring out bowls of water for furry friends. Found in the Riverside Hotel, The Sand Bar has an expansive outdoor patio bar that's located around the back of the hotel on the river bend. If you’re out for a bike ride, walk or jog with your dog this the perfect place to hang along the Green Belt. Considered to be in one of the most popular parts of downtown on the corner of 8th and Main, Fork has great food and plenty of shade for your dog. Even rated on BringFido.com with 5 Bones (Equivalent to 5 stars). What was once known as The Left 2, The Shed has made a name for itself. With a great menu and arcade games, you can also check out their outdoor seating in the back of the restaurant. No need to leave your doggo at home when The Shed is dog-friendly! Located in the heart of the North End in Hyde Park, you can find the quaint little Sunray Cafe. Pet-friendly and a great place to bring the whole family, check them out for breakfast, lunch or dinner. This American cuisine restaurant is a must-stop spot on 8th Street in Downtown Boise. There are tons to choose from on their menu, and they even have a full bar. The Restaurant doubles as both kid and dog-friendly. If your furry pal is lucky, you might even break off a piece of your gourmet burger and share!